Neelix is leading a scavenger hunt on a world which is abundant in vegetation, restocking the kitchen is vital but a ship is detected in orbit and it turns out to be Kazon, as the away teams are beamed back Chakotay goes in search of Seska and finds her in a large cavern where Kazon are sneaking about. After a brief firefight they escape and return to the ship safe and sound. 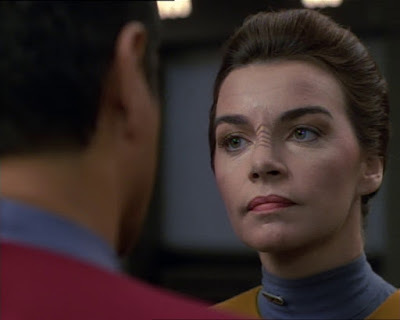 Later that evening Seska ( Martha Hackett ) visits Chakotay in his quarters bringing some mushroom soup, he's appreciative but when he learns she and a few others stole ingredients from the kitchen he puts them and himself on restricted rations. 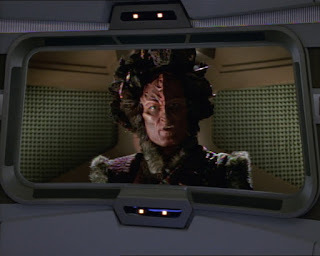 Voyager detects a mayday coming from the same Kazon ship, Neelix advises caution but they go to help and find only one survivor, the rest of the crew seem to be fused with the very structure of the ship and more mysterious is the console on the bridge which seems to have Federation technology incorporated into it. Janeway orders the engineering crew to remove the device in order to confirm the source of the tech and Seska being alone on the planet is viewed with suspicion however Chakotay defends her. As the investigation continues it turns out that Seska does not have her blood type/spec on file but she then attempts a risky procedure to recover the console, she is hurt and is taken to sickbay. Another Kazon ship arrives demanding to see the survivor of the other ship, when they visit sickbay First Maje Culluh ( Anthony De Longis ) provides a distraction while his officer injects a neurotoxin into the man who then dies very quickly. 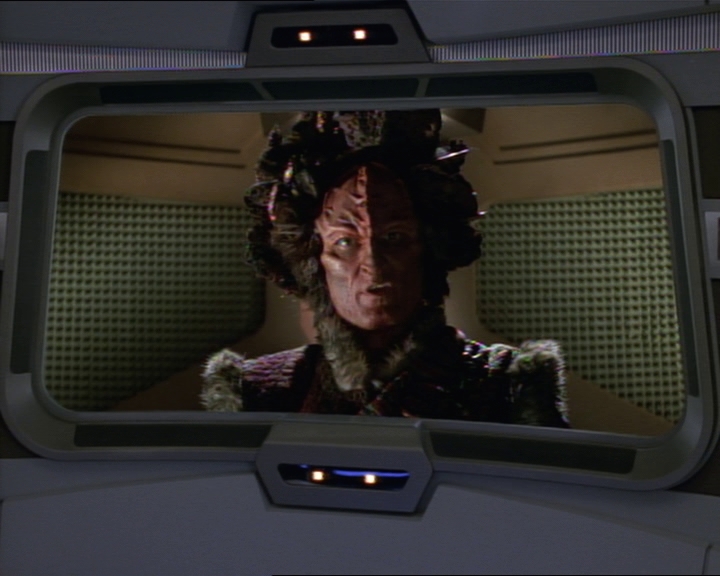 Eventually they remove the console from the Kazon ship despite the threats from Culluh and it is indeed sourced from Voyager and another surprise is that Seska does not have any Bajoran blood factors and is much close to Cardassian. Chakotay confronts her with this and she informs him of an illness she had as a child and being saved by a bone marrow infusion from a Cardassian woman, it seems to satisfy him and he goes onto tell her of the status of the investigation. It was however a ruse, they are monitoring the computer and they detect the manipulation of the data and they know that she has implicated herself to throw suspicion on Lt. Carey. Alas she was still one more step ahead and when confronted she blames Janeway for stranding them here and riles against Federation rules, she then beams off the ship to the nearby Kazon vessel and it warps away. Hands up I never liked the Kazon, as a recurring threatening villain they never made much sense even when their backstory was fleshed out, they stuck around far too long given Voyager was constantly heading towards the Alpha quadrant and well they looked stupid. This is pretty much my first return to the Kazon episodes, I watched them on first broadcast but never really wanted to watch them again especially compared to some of the much better episodes later in the series. Ok were nearly done, let's say the Kazon had some cloaking tech which close to a planet gave them some protection but how in the universe does a Kazon ship sit 14 kilometers off of Voyager undetected and in a position to accept a transport beam and get away before the automated defence protocols on the ship reacted? I know Seska had to escape, she was too good a character to discard but it was so stupid how it was done or allowed to happen, perhaps Tom was looking in the wrong direction this time. State Of Flux is a pretty good first season episode of Voyager and a lot better than I remembered it to be, the Kazon are still ridiculous though but we've just got to put up with them for the time being.